From 1900 to 1929, the Rochester and Sodus Bay Railroad ran trolleys from Rochester to Sodus Point; a distance of 44 miles. It was known as The Royal Blue Line due to the fact that at first, all the trolley cars were painted a royal blue color. In the month of May it was often referred to as The Apple Blossom Line as many special cars took hundreds of people along the Ridge Road to see and smell the apple blossoms. In 1901, a trip from Rochester to Sodus Point cost $1.32 on the trolley. The trolley was an important part of Sodus Point commerce for not only the tourists it transported but also for the freight it carried. Along with locally grown produce, it also carried mail to and from Rochester. The trolley used 60 lb. narrow gauge rails (the weight was from a 3 foot section) laid on gravel that came from the Glen Edith quarry near Rochester. Thirty five sidings were located approximately every mile for the expected traffic of one trolley every five minutes that was never realized. Business was such that a car ran every hour. The trolley used 625 volts DC current and required battery stations to boost power along the lines. Two of these stations were located at Webster and Williamson with substations at Ontario and Sodus. When first laid, the terminus ended here in Willow Park. The erected trolley pole (which was recovered from a nearby ravine) was most likely the Sentell stop number 140. The date it was erected (1922) can be clearly read on its surface. NYS RYS stands for New York State Railway System. It was soon discovered that low voltage did not allow the trolley to carry passengers up the steep hill here and after several months the track was removed so it ended at the top of this hill. The long, narrow building at the top of the hill became the Trolley Station for Sodus Point. 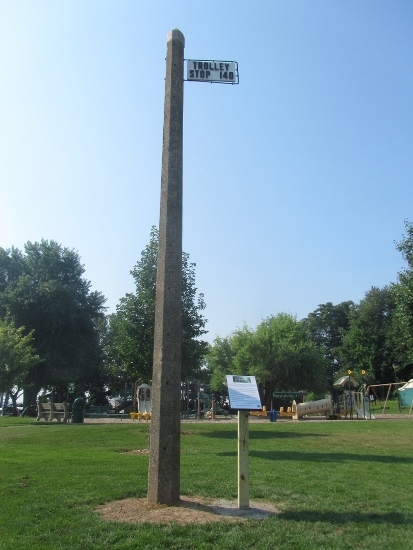 Another original trolley pole still stands about ¾ of a mile due west of here on Lake Road. The Prozens Stop was named after the Proseus family when the name was incorrectly read off a document. The owners of the Rochester and Sodus Bay Railroad were always seeking ways to increase passenger levels. In Sodus Bay they partnered with the Steamship Arundell. They advertised the “All the way Around” trip that allowed passengers to take the trolley to Sodus Point , then for $1.00 they could take the Arundell back to Charlotte and then in Charlotte re-board a trolley and return to the Rochester station.